The chance of frost is finally gone! Time to put out your annual color! 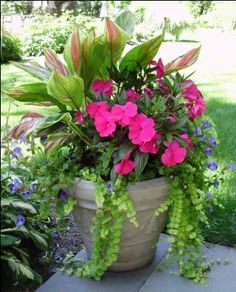 Container gardening is a great way to add color and interest to every yard or entry way. An easy way to construct an annual color container is to think in terms of thriller, filler and spiller. The thriller element gives height to the container, and adds drama. This plant could be a tall flowering annual such as a bright red salvia, Purple or white angelonia or colorful snapdragons. The thriller plant could also be something with tall and interesting foliage like a dracaena spike, or elephant ear. Filler plants are meant to fill out the middle of the container, adding color and texture between the tall drama of the thriller and the trailing grace of the spiller. Great filler plants are nemesia, ageratum, geraniums, marigolds, impatients and short varieties of coleus. The spiller plants cascade over the edge of the container adding grace and a feeling of abundance to any container. There are great flowering and interesting foliage plants that can be used as spillers. A few of my favorites are petunias, million bells, bacopa, trailing vinca, sweet potato vine and lamium. 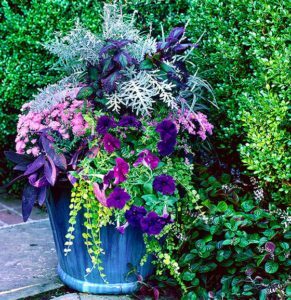 Following the Thriller, Filler, Spiller rule is an easy way to create containers that are bursting with color and interest. 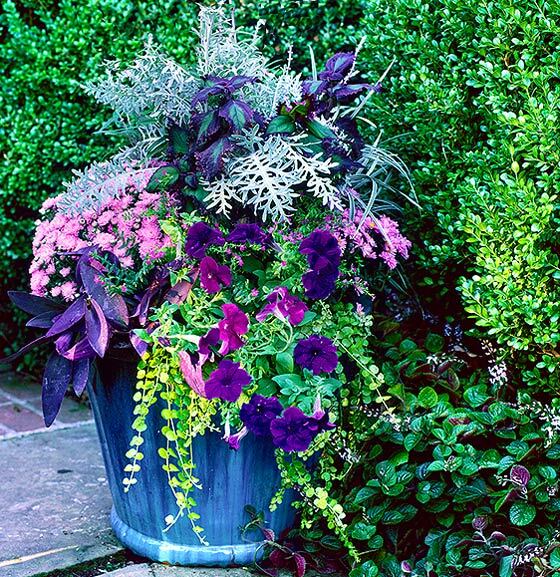 Another trick to creating beautiful and eye-catching container gardens is to keep the color palette simple. Although it is tempting to fill your containers with all of your favorite colors, choosing just one or two colors will make them more impactful. This also makes shopping simpler. Focus on one core flower color and then accent the color with interesting foliage plants, like variegated vinca, chartreuse coleus or the silver leaves of trailing licorice plant. 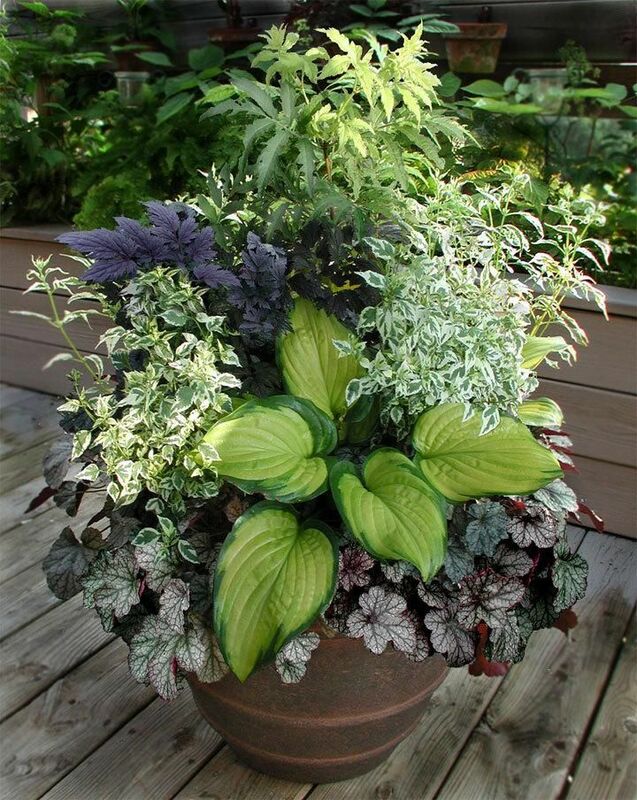 Interesting foliage plants add an element of surprise and upgrade any container design. Follow these few simple rules and soon you will be creating gorgeous containers like a professional! Designing containers is a fun way to play with color, shape and texture and is a great way to hone your design eye.